The central committee of the Gorkha Janmukti Morcha today decided to expel Bhupendra Pradhan, popularly known as Pradip Pradhan, who switched to Trinamul today, from the party. Soon after the central committee session, the GTA Sabha members met at Gorkha Rangamanch Bhavan and submitted a written request to the GTA Sabha vice-chairman, Lopsang Yolmo, to convene a special meeting where, sources said, they would seek the removal of Pradhan as the GTA chairman. The meeting is likely to be held on August 26. Morcha general secretary and the GTA Sabha member in-charge of education, Roshan Giri, said: "At the central committee meeting, we discussed the Gorkhaland issue. The party has also decided to expel Pradip Pradhan from the primary membership." A source in the GTA said: "According to Section 37 of the GTA Act, a special meeting can be requisitioned by one-third of the Sabha members and once the vice-chairman convenes a meeting, the chairman can be removed by a resolution adopted by a simple majority of the total number of elected members of the GTA Sabha." There are 45 elected members in the GTA Sabha. 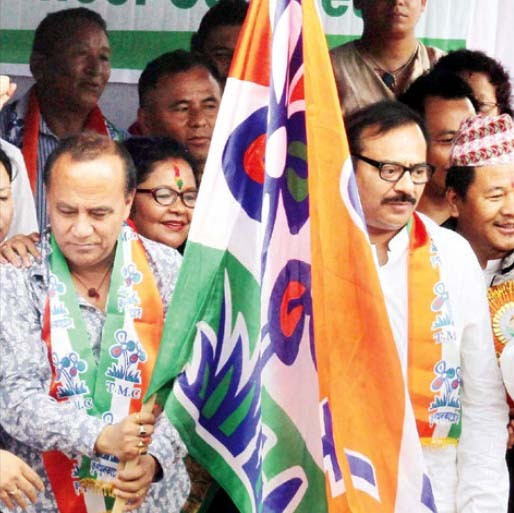 The Morcha has also decided to hold a public meeting in Kurseong on Sunday. According to sources, the move is an attempt to boost the morale of party cadres in the area and counter the Trinamul gathering where Pradhan switched allegiance. Today, around 300 voluntary teachers, who were members of the Janmukti Insecure Secondary Teachers' Organisation (JISTO) Movement Committee, burnt the effigy of Giri here before resigning from the Morcha. The hill party had disbanded the Movement Committee last month after some of the members had criticised Giri alleging that he had not been working towards regularising the jobs of the 500-odd voluntary teachers in more than 120 schools across the hills. Amit Gurung, the co-ordinator of the erstwhile Movement Committee, said: "We burnt the effigy of Roshan Giri today. Around 300 members have resigned from the party. We will soon meet chief minister Mamata Banerjee and decide our future course of action." The teachers have decided to remain apolitical at the moment, sources said. Told about the development, Giri said: "If by burning my effigy, their jobs are regularised, they are most welcome to burn my effigy everyday." At Darjeeling Motor Stand, the Gorkha Janmukti Vidyarthi Morcha started a relay hunger strike "for Gorkhaland" today with seven student leaders participating in it. GTA Sabha members met at Gorkha Rangamanch Bhavan and submitted a written request to the GTA Sabha vice-chairman, Lopsang Yolmo, to convene a special meeting where, sources said, they would seek the removal of Pradhan as the GTA chairman.